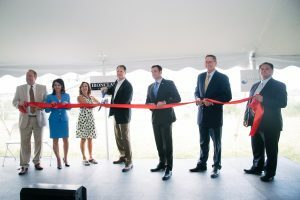 Rochester Chamber member RED-Rochester, LLC (RED) held a ribbon cutting ceremony celebrating the completion of its $75 million new boiler house located at Rochester Chamber Partner member Eastman Business Park. The boiler conversion project was implemented to comply with the US EPA’s Industrial Boiler Maximum Achievable Control Technology (BMACT) rule to reduce hazardous air pollutants. RED has completed a $75M investment that has fully retired 127 years of continuous coal-fired utility operations in Eastman Business Park and has replaced it with four new clean-burning natural gas fired boilers and converted an existing coal fired boiler to natural gas. These five boilers have the capacity to generate up to 1.5M pounds of steam per hour and are the mainstay of RED’s tri-generation utility services plant. Eastman Business Park is completely coal-free for the first time in over 127 years. ark’s 1,200-acre industrial campus with over 16 million square feet of multi-scale manufacturing, distribution, lab and office space, interstate rail and highway access in combination with RED-Rochester’s unique suite of 16 utility services, to include an industrial waste water treatment facility, make the Park a world class destination for industry to grow and thrive. RED-Rochester, LLC of Rochester, New York is a wholly owned subsidiary of Ironclad Energy Partners, LLC of Lombard, Illinois. Ironclad Energy Partners, LLC is a portfolio company of Stonepeak Infrastructure Partners of New York, NY. Eastman Business Park is a 1,200-acre R&D and manufacturing campus with over 16 million square feet of multi-scale manufacturing, distribution, lab and office space. There are currently almost 110 companies onsite employing over 6,000 people, many of them responsible for the development of our nation’s next generation technologies in the areas of Energy Storage, Chemical Manufacturing, Roll-to-Roll Manufacturing and Photonics. Additionally, the Park’s immense manufacturing infrastructure—including the private utilities and onsite water and wastewater management system—is a competitive advantage for its high-use tenants. RED owns and operates EBP’s utility infrastructure and offers a suite of sixteen different utility services. RED’s competitive priced utility services originate from harnessing the efficient tri-generation of electricity, steam and refrigeration from the combustion of a single source of fossil fuel in their new natural gas fired boilers. RED’s utility offerings include: electricity, four different pressures of steam, chilled water, nitrogen, compressed air, potable water, industrial process water, demineralized water, high purity water, fire protection water, natural gas, and industrial waste water treatment with precious metals recovery through a Title V/RCRA permitted multiple hearth incinerator. RED currently serves over 110 customers in EBP. Many are globally recognized leaders in their industries who demand nothing less than world class utility service reliability.